Smart Namo, an independent body, (Next generation Android Mobile Odyssey) will soon launch the Smart Namo quad core handset in honour to Narendra Modi. The group is also planning to make it a signature edition (with Narendra Modi’s signature). The Smart Namo will come with a 5 inch screen HD (1920x 1080) pixels resolution with corning glass 2 protection. The handset will be available in different variants example 2GB / 16GB, 2GB / 32GB and 2GB /64GB as per their website. It will be powered by 1.5GHz MediaTek quad core processor MT6589T and will also houses dual camera, the rear camera will be of 13MP resolution. SmartNaMo will also be establishing an assembly unit in Gandhinagar (Gujarat) where the NaMo branded smartphones and feature phones will be assembled. As per the sources, the handset will be launched soon, by end of August in Gujarat. It is a china based handset company , basically Gujarati by their Native, have came up with this idea looking at the Modi's popularity. Reports say that they will present the phone to Mr.Narendra Modi and get his signature and ask for his permission to use it at the back panel. The group has already came up with their offical website and they are also active on their facebook fan page. 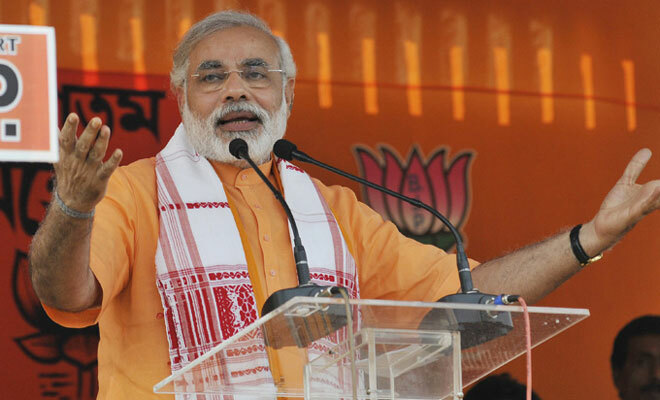 Narendra Modi to be the PM Candidate, will contest from Varanasi ! So the news from the sources is that, All lines are clear for Narendra Modi to be the PM Candidate for NDA in the upcoming Loksabha elections 2014. Economic Times has reportedly said that BJP has decided their PM candidate and may officially announce Modi as their PM candidate by the End of July. Its known that the way to Delhi is via Uttar Pradesh which has the Maximum Loksabha seats. Economic Times reports say that one official RSS Leader has told that Modi may represent Varanasi in the upcoming Loksabha elections 2014. BJP will be looking to sweep maximum number of seats in Uttar Pradesh to gain a strong position in the elections. The reports also say that top RSS leaders has consoled Lalkrishna Advani also, not to oppose Modi as the PM Candidate, and he has reportedly agreed. Its known that JDU, who was opposing Modi as PM Candidate, broke the 17 year old alliance. Most of the BJP volunteers and leaders see Modi as the upcoming PM of India. Modi is backed by many religious persons. Swami Ramdev has openly came up in support of Modi. Modi carries a huge support over the Social media too. It would be very Interesting to see the contest between Rahul Gandhi and Narendra Modi in the upcoming elections.